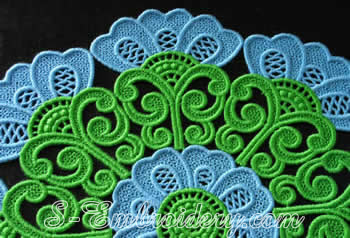 A large set of free standing lace embroidery designs. 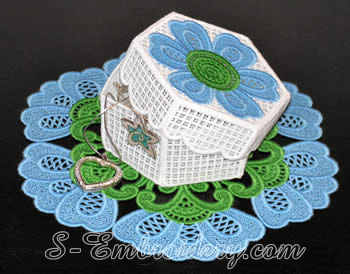 The embroidery components included in this set can be used to create several freestanding lace bowls, 4 freestanding lace doilies, 1 freestanding lace box and 2 freestanding lace coasters. Sample photos of the ready products are available further down this page. The set includes 3 lace bowl bottoms and 3 lace bowl side panels. These components can be used in any combination to produce a minimum of 3 different freestanding lace bowls. 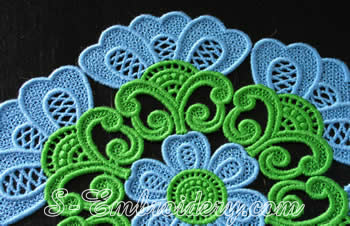 Used in combination with Doily side #1 to create the large ( 12.20 inches/31 cm) freestanding lace doily featured here. This detail can be used both in combination with Doily side panel # 2 to create the smaller (9.5 inches/24 cm) freestanding lace doily and separately. When using this detail separately you can create the doily featured here or a doily with a size of your choice. This is a smaller version of the Coaster #2 design. 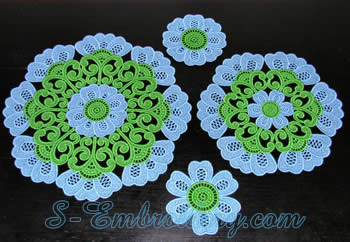 You can use it to create a doily with a size of your choice. Note: The box lid can be used as a flower decorated bottom of a freestanding lace bowl.